Will one of these girls be the next Michelle Yeoh? Possibly, but none of them seems to harbor such lofty aspirations. Regardless, they all train harder than most professional athletes in hopes of earning a better life for their families (shouldn’t that be the other way around?). 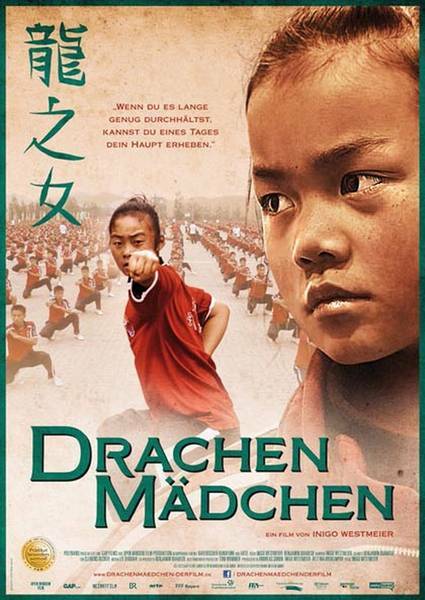 Inigo Westmeier observes the rigorous routine of the Shaolin Tagu Kung Fu School’s students in Dragon Girls (trailer here), which screens during the 2013 Brooklyn Film Festival. For these mostly poor provincial students, kung fu school can lead to better military and police jobs than might otherwise be available to them. Unfortunately, the seven day training regime does not leave much time for the kids to be kids. The Shaolin Tagu School accepts both boys and girls, but Westmeier devotes about ninety percent of his attention to the latter, focusing on three particular girls with complicated family circumstances. Much like the apparently abusive Shanghai Circus School documented by Guo Jing & Ke Dingding, life at Shaolin Tagu does not look like a lot of fun. On the other hand, at least it offers the girls some camaraderie. Given the realities of life for poor rural girls (such as the protagonist of Wang Bing’s Three Sisters), things could arguably be worse for the students. Still, the sanctimonious headmaster is obviously cutting corners with respects to sanitation and nutrition. Yet, the most trying aspect for most of the girls is the lingering sensation of abandonment. Clearly, the school functions as an alternative to an orphanage for many essentially absentee parents. Westmeier captures his three primary POV figures at their most open and vulnerable moments. Frankly, it is often difficult watching them struggle physically and emotionally, because they are really just kids. The extent of the headmaster’s authoritarian indoctrination is nearly as disturbing, if not more so. Despite all the issues the film raises, seeing the collective student body of 35,000 in action is admittedly impressive. For an observational style doc, there is a heck of a lot of spectacle in Dragon Girls. These kids are good—but the monks in the Shaolin monastery next door are probably better. As one might expect, they are less dogmatic and far more Zen-like in their approach to martial arts. Westmeier tellingly contrasts the two so-close-yet-so-far-apart Shaolin institutions without belaboring the point. Dragon Girls further testifies to the vast class divisions demarcating today’s China. It might be tough viewing, but it is an honest reflection of reality. The extent to which Westmeier melds the social issue documentary with martial arts cinema is also rather notable. Recommended for fans of both genres who can handle some unvarnished truth, Dragon Girls screens this Saturday (6/1) at Windmill Studios and the following Thursday (6/6) at IndeiScreen as part of the “Magnetic” 2013 Brooklyn Film Festival.